Cumberland Pigs were a pig from Northern England that are now extinct. They were used to produce local delicacies like the Cumberland sausage and Cumberland ham. The breed became extinct in 1960, after changes in farming methods and a demand for less fatty meat led to it falling out of favor. Cumberland Pigs were a very old breed that likely developed over several hundred years in Cumberland and Westmorland, and was closely related to the Old Yorkshire white pig. They were a heavy-set white pig with pendulous ears, and a tough constitution that enabled them to withstand the poor weather of Northern England. 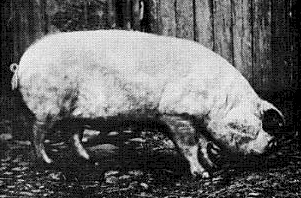 During the 19th century, many efforts were made to improve pig breeds, and the Cumberland was often crossed with the Yorkshire white breeds, which eventually developed into the Large White, Small White, and Middle White. The Cumberland Pig Breeders Association was created in 1916, and the breed reached a height of popularity during the 1920s. Cumberland pigs began to fall out of favor in the mid-20th century due to a demand for leaner meat. In 1955, the Advisory Committee on the Development of Pig Production in the United Kingdom issued a report that pig farmers in the UK, to ensure standardization, should concentrate on three breeds: the Large White, Welsh, and Landrace. By this time, the Cumberland stock was already dwindling and only three boars were licensed by 1954. The Cumberland pig is considered to have become extinct in 1960 after the last individual, a sow belonging to a Mr. Thirwall, died on Bothel Craggs farm in Bothel.